The Acharya N.G. 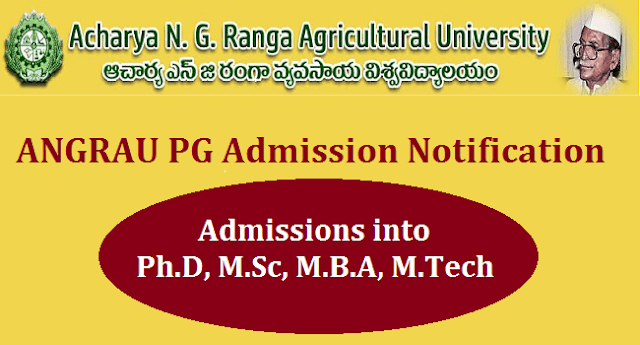 Ranga Agricultural University (formerly Andhra Pradesh Agricultural University) established during 1964 is responsible for Education, Research and Extension in Agriculture and allied fields in the state of Andhra Pradesh. The University imparts instruction leading to the Master’s and Doctoral degree courses in Agriculture, Home Science / Agricultural Engineering and allied fields. MBA (Agri-Business Management) B.Sc. (Ag. ) / Hort. / B.Tech. (Ag.Engg.) or B.V.Sc. & AH / B.F.Sc. / B.H.Sc. / B.Tech (Dairying) / B.Tech (Food Technology) / B.Sc. (Food Science & Technology) / B.Sc. (CA&BM) of 4 years duration. Applications for all courses duly filled in including those sent through Employers should reach “The Registrar, Acharya N.G.Ranga Agricultural University, Rajendranagar, Hyderabad-500 030 on or before 12-06-2017 by 4.00 PM. Postal delays will not be condoned. M.Sc. (Ag.) In-service candidates may send advance copies of applications alongwith certificates so as to reach on or before the above date to save delay in forwarding applications by the employers.